This first official esports league operated by a U.S. professional sports league featured 17 teams in its inaugural season, which began in May. The Lakers, Nets, Timberwolves and Hawks have already committed to joining for next season, meaning more than two-thirds of the NBA’s 30 franchises will also have a team of gamers. Donohue said the teams that haven’t signed on yet are busy with other NBA business, such as building or renovating arenas or hosting All-Star Games. He doesn’t want them to take on an esports entry until they’re ready, and he believes eventually they will be. “And so we fully expect at some point all 30 NBA teams to be a part of this and then beyond that,” he said. Donohue said the season exceeded all the league’s expectations, pointing to weekly increases in viewership on Twitch, the streaming service popular with video-game players, and a social media presence that includes more than 1.6 million followers of the league and its teams on social media platforms. The league will continue to explore ways to find even more viewers. The NBA season nowadays heats up once the games have ended, as the draft, free agency and summer league have had as much to do with its popularity as the action on the court. And some of the league’s players — who competed as themselves, not players on the real the NBA clubs — were already popular in the gaming community from competing in other leagues and tournaments. Donohue expects they’ll continue to do so in the NBA 2K League offseason. 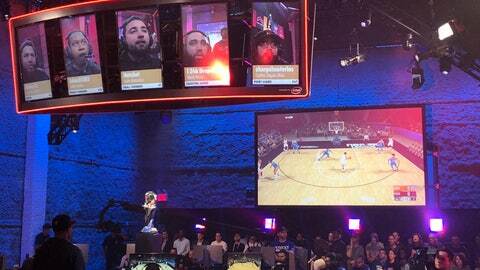 Eventually the league hopes to play games elsewhere, with all games this season held at a studio in New York. Esports leagues such as Overwatch and League of Legends have played their competitions in arenas, but there are no plans for that yet. That’s for the future. On Saturday, the focus was on an out-of-nowhere championship season. “It was magic,” Kahl said.